Tripp Lite's TLP76MSG offers reliable, GREEN surge technology that protects your computer and peripherals as well as the environment and your wallet. 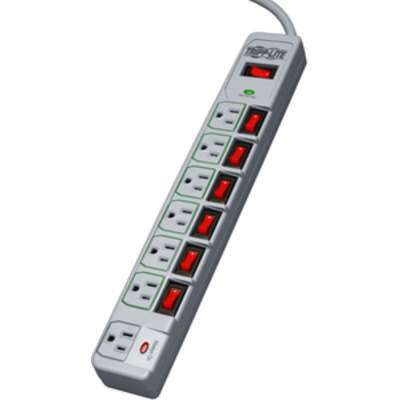 Energy-saving outlet configuration reduces energy waste (phantom loads) by cutting AC power to unused peripherals. The TLP76MSG has one always on outlet for those peripherals that need constant power like a fax machine, DVR or router. It also offer convenient, individual outlet switches that allow users to select which device is turned on and off. 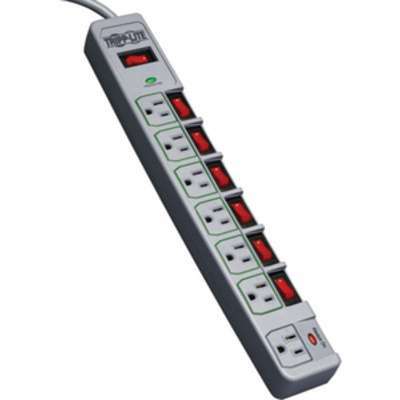 The TLP76MSG has 7 total outlets, 6 foot cord and diagnostic LEDs to warn of wiring problems and suppressor damage. Network-grade AC suppression rated at 1080 joules shields equipment from surges and line noise. Designed with an attractive cool gray suppressor housing, the TLP76MSG can accommodate up to 4 transformer plug outlets offering convenient protection of desktop computer equipment and accessories. $25,000 Ultimate Lifetime Insurance (U.S., Canada, and Puerto Rico only).